After losing Terrell Suggs, Za’Darius Smith and Eric Weddle all over the course of the last three days, the Baltimore Ravens got a big boost on Wednesday as ESPN’s Adam Schefter reported that former Seattle Seahawks safety Earl Thomas intends to sign a four-year, $55 million deal with the team that includes $32 million fully guaranteed. Up until Wednesday morning, Earl Thomas headed our list of the top-25 free agents available – and for good reason. 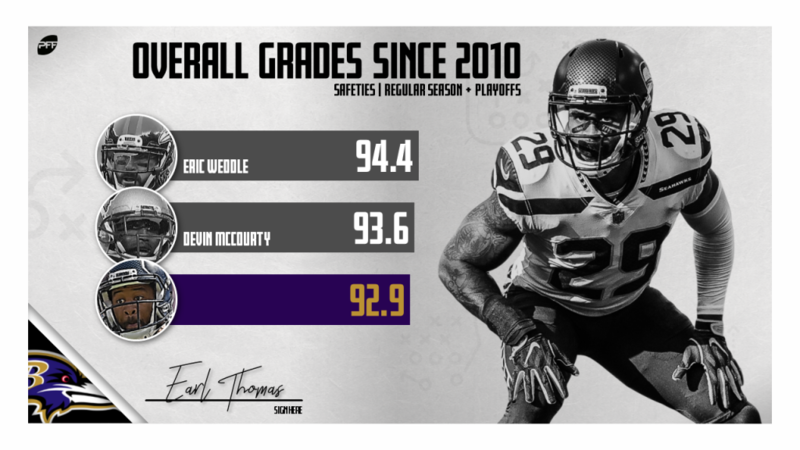 While he may be 30 years old and coming off another broken leg, he’s graded at 90.0-plus in each of the past two seasons and has shown no signs of slowing down. We’ve spent time in the past quantifying how well Thomas plays in that role, but now it’s time to explore why exactly he is that good and why it’s so critical to that defensive scheme. Thomas has more than enough range to get to the sideline from a single-high look, something most safeties from that alignment struggle with. In fact, he has so much range that he can get to either sideline without being aligned in the middle of the field. The Seahawks can cheat their coverage looks by leaning Thomas in one direction or the other, knowing that he can still make it back to the far side deep ball. This allows them to help specific cornerbacks, react to offensive formations and personnel wrinkles from an alignment standpoint and still be able to be a factor on the deep pass down the sideline. Clocked at 4.43 seconds at the combine, Thomas has as fast a 40 time as you’re likely to find from a safety, but like all great players, the first yard is in his head. He sets off earlier to the play than any other safety because of how quickly he can read, diagnose and react to the play. What is often labeled as ‘instincts’ is actually the product of relentless tape study and the understanding of opposing offenses and passing concepts, allowing him to appear in places other safeties never get close to. This speed, quickness, diagnostic ability and reaction time all fold together to create the term ‘range’ that gets applies to Thomas, and it simply means that from any given alignment on the field pre-snap, he can cover a greater area of the field than anyone else. Because of that, he can impact more plays than most safeties, or any safety that is tasked with lining up as a single-high free safety. It has indeed been those next-level instincts and that ability in coverage that has separated Thomas from the pack over recent seasons. 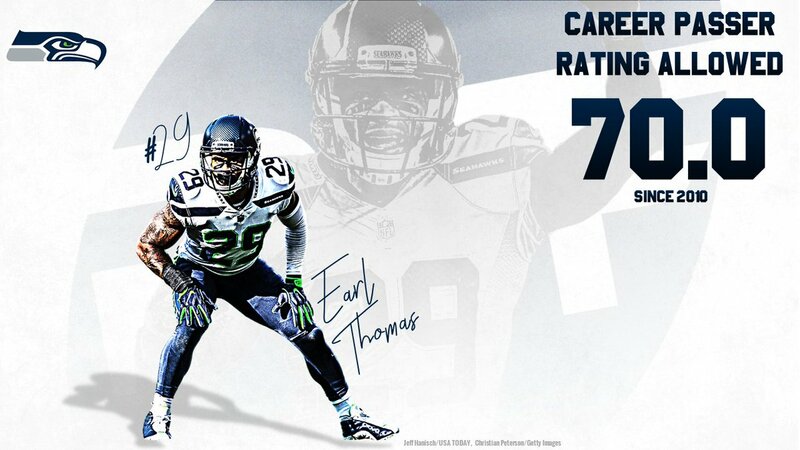 Since joining the Seahawks with the 14th overall pick of the 2010 NFL Draft, Earl Thomas’ work within the so-called “Legion of Boom’ has put him among the very best to ever play the position. His coverage grade of 92.7 is the fifth-best mark among qualifying safeties in that nine-year span, while his 64 combined pass breakups and interceptions and his 80 total coverage stops rank second and fourth among safeties in that span, respectively. With the recent addition of Odell Beckham Jr. to the rival Cleveland Browns and the departure of veteran safety Eric Weddle, Ravens fans would have undoubtedly woken up this morning feeling a little apprehensive. However, the addition of the arguably best free safety in the NFL will go a long way to change that. And for the neutral? Well, twice a year we now get to see talents like Baker Mayfield, David Njoku, Jarvis Landry, and Odell Beckham Jr. go up against Earl Thomas, Tavon Young, Marlon Humphrey and Tony Jefferson — and that can only be a good thing.